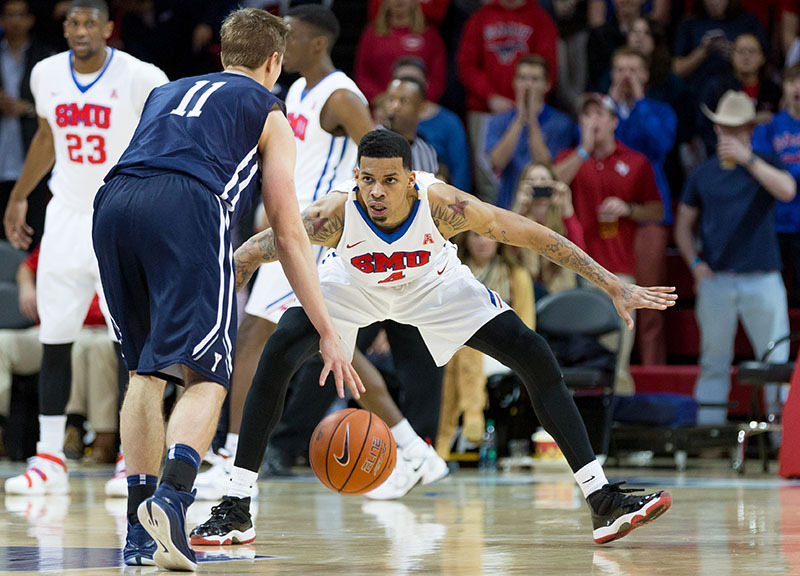 SMU's Keith Frazier Looks Poised To Have The Breakout Season His Team So Desperately Needs. Heading into halftime of Sunday's game against the Yale Bulldogs, the Southern Methodist University men's basketball team was in a bit of a rough spot, down 32-40 on their home floor at Moody Coliseum. Yale point guard Makai Mason was having his way with the Mustangs defense: He racked up 16 points, five assists and nabbed an opportunistic steal from Mustangs point guard Nic Moore that resulted in a hard foul on Mason by forward Ben Moore. From the get go, it was a rough-and-tumble match with a lot of turnovers from both teams. But the Bulldogs hit six threes in that half to give themselves a comfortable lead at the break. Then something happened in the Mustangs locker room during intermission. Per SMU associate head coach Tim Jankovich, junior guard Keith Frazier requested to cover Yal leading scorer Mason in the second half himself — and quite emphatically at that. In the opening minutes of the second half, Frazier blanketed Mason to the point that the Bulldog point guard hardly touched the ball. Meanwhile, on the offensive side of the ball, Frazier tried to spark some activity — with varying degrees of success. Save for an impressive give-and-go layup, he missed most of his jump shot and drive attempts. But all that effort still proved effective: Midway through the second half, as Frazier completed an alley-oop pass from Nic Moore, he gave his resurgent team a 55-51 lead. Moody Coliseum erupted. Frazier beat his chest and flexed his muscles down the court. And then he returned right back to his blanket coverage of Mason with a confidence that Mustangs fans have only seen flashes of throughout the junior guard's time in the program. With Frazier on him, Mason's production was cut in half. The Yale guard scored just eight points in the second half and earned just two assists after Frazier took over. That adjustment pretty clearly paved the way for SMU's comeback, which ended in a 71-69 victory over Yale. The performance was one of Frazier's most complete games as a Mustang since he arrived on campus two years ago. At that time, the Dallas product was a five-star talent — and Larry Brown’s first major freshman recruit after luring in transfers Markus Kennedy and Nic Moore. His freshman season was generally lackluster compared to expectations, as he averaged 5.4 points per game and 0.9 assists in 14.8 minutes per game. His sophomore season looked to be an improvement, and it was off to a promising start with averages of 10.5 points per game and four rebounds per game. Then Frazier was ruled academically ineligible for the remainder of the season. As Jankovich put it after the game, fans have only seen Frazier in small doses and abbreviated circumstances. His freshman season saw limited minutes, and his sophomore season was cut short due to his suspension. But so far, just three games into this season, Frazier is second on the team in minutes played, averaging 11 points per game on offense, and shining on the defensive side of the ball. That defensive improvement is substantial. After Sunday's game, Jankovich joked that Frazier couldn't guard anyone in street clothes back during his freshman season. 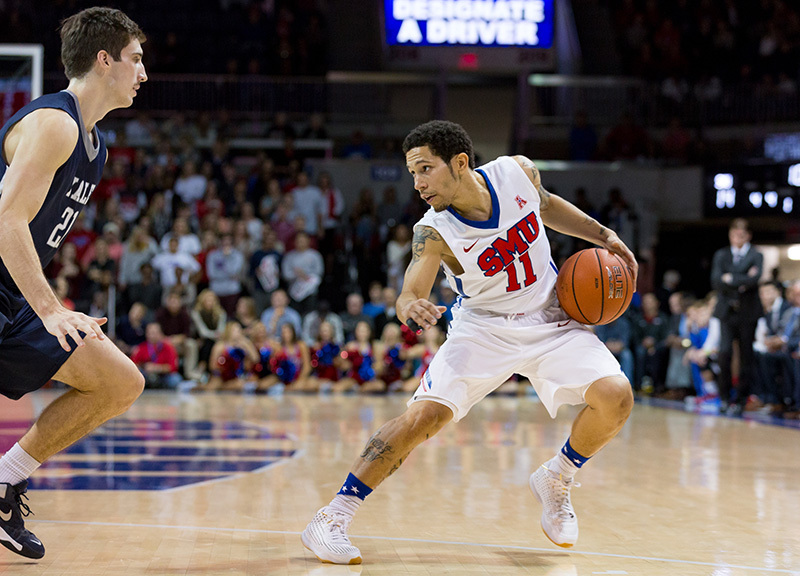 He's always been considered an offensive weapon, but with SMU boasting one of the smallest rosters in the conference this season, Frazier's efforts on both sides of the ball are much needed — both on the court and off of it, as many fans are likely to point toward Frazier's errors as the reason for the team's suspension from post-season play this season. Sunday's win over the Yale Bulldogs was also bolstered by strong performances from Sterling Brown, Markus Kennedy and James Tolbert. But it was Frazier's performance that stood out the most. As his team (3-0, ranked No. 25 in the Associate Press poll) mires away in its Lost Season, Frazier could be on the verge of a breakout year. SMU Mustangs guard Nic Moore is greeted by teammates during the announcement of the starting lineup. 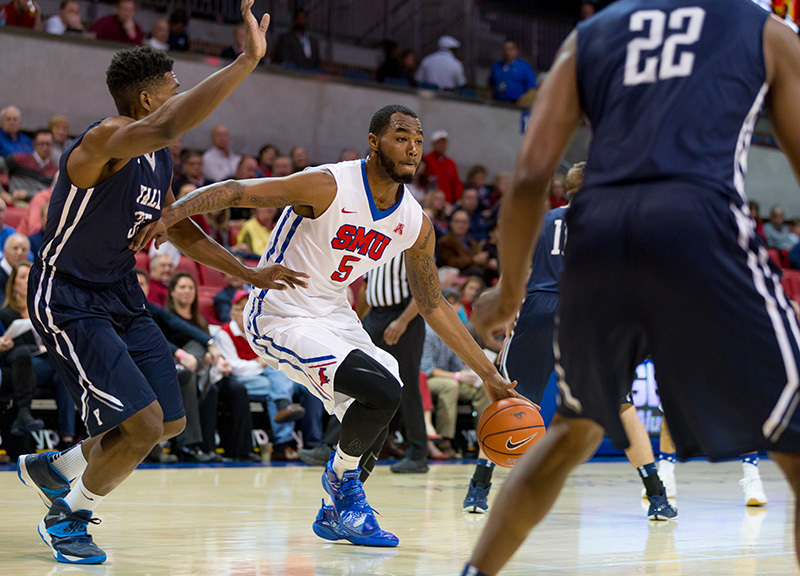 SMU Mustangs forward Markus Kennedy (5) drives to the lane against Yale Bulldogs defenders. Kennedy recorded a double-double in the win over Yale with 12 points and 13 rebounds. 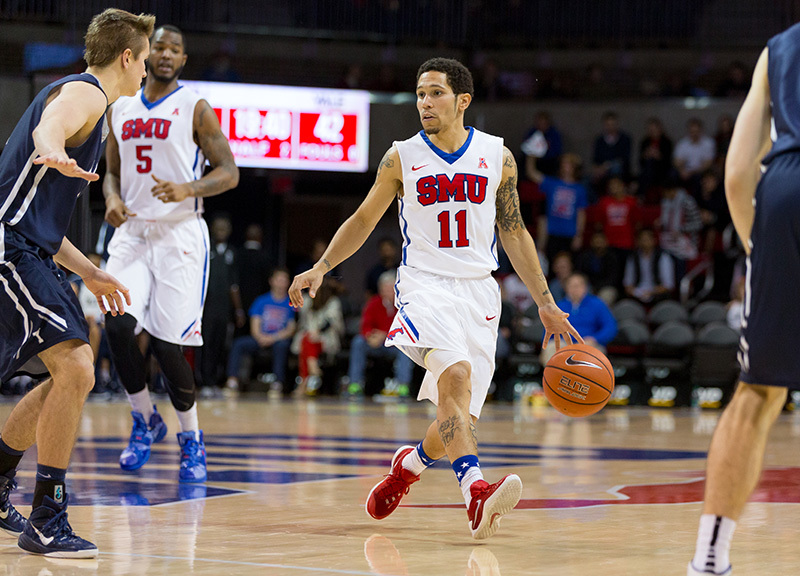 SMU Mustangs guard Nic Moore (11) brings the ball up the court and scans the floor. Moore finished the game with 11 points and four assists. SMU Mustangs guard Jarrey Foster (10) looks to pass the ball during the first half of an NCAA basketball game against the Yale Bulldogs. Foster, a true freshman, recorded two points and three rebounds in 11 minutes of play. 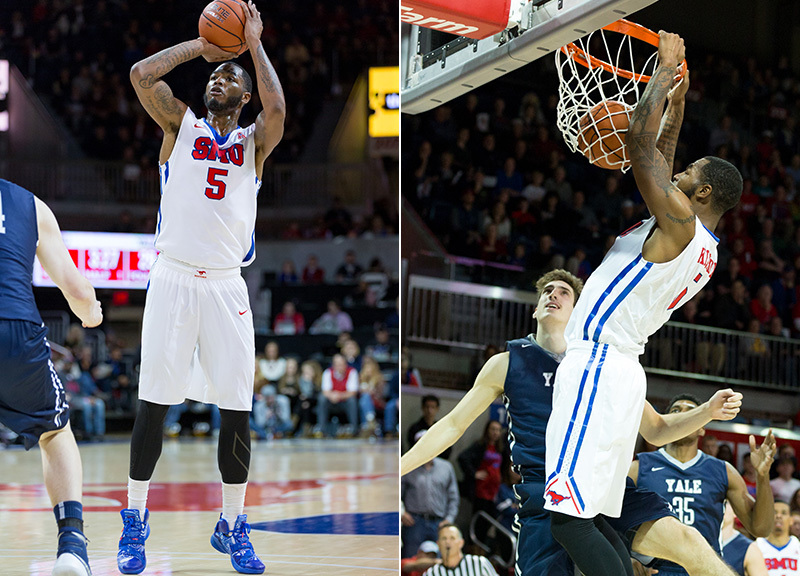 SMU Mustangs forward Markus Kennedy (5) attempts a shot (left) and dunks (right) against the Yale Bulldogs in the 71-69 victory. 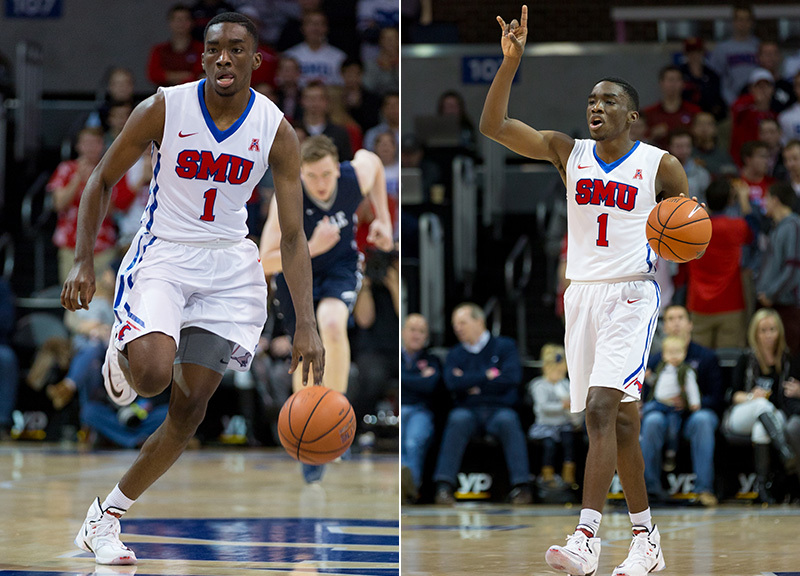 SMU Mustangs guard Shake Milton (1) brings the ball up the court during an NCAA basketball game against the Yale Bulldogs. Milton earned the American Athletic Conference Rookie Of The Week after his collegiate debut against the Sam Houston Bearkats. 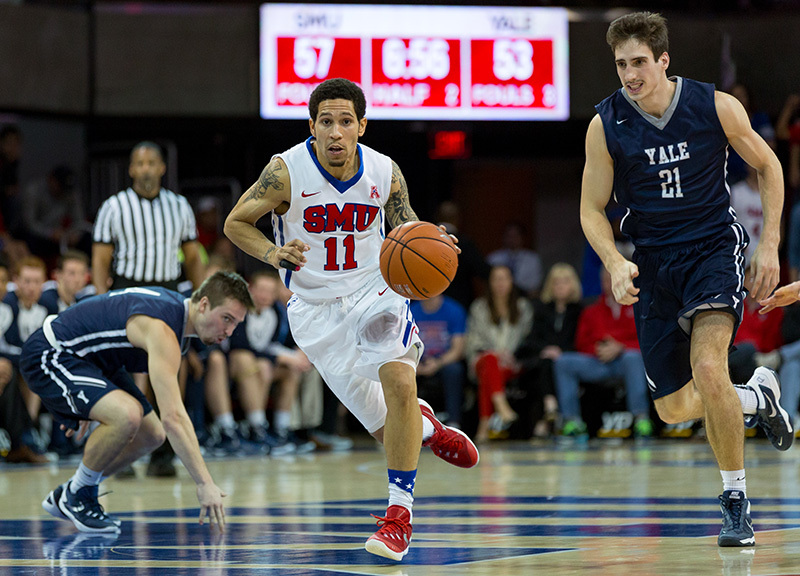 SMU Mustangs guard Nic Moore (11) dribbles back against a Yale Bulldogs defender. 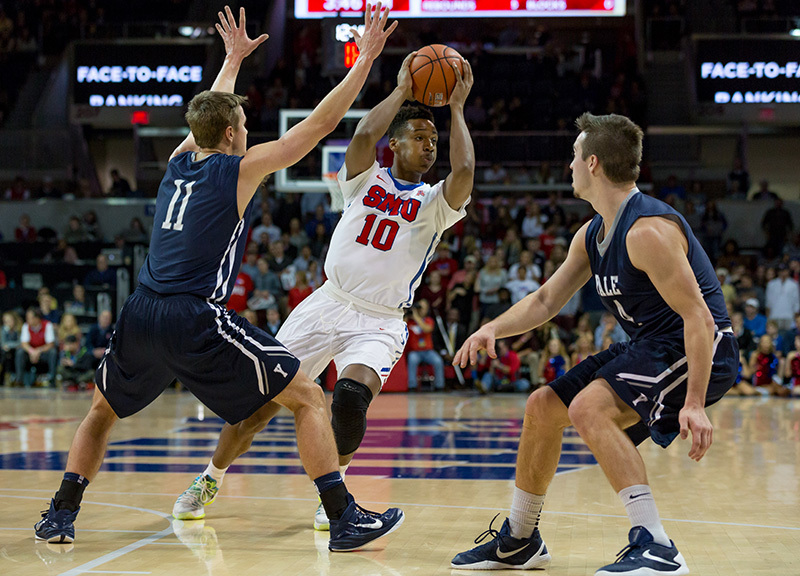 SMU Mustangs guard Nic Moore (11) scans the court during an NCAA basketball game against the Yale Bulldogs. SMU Mustangs guard Keith Frazier (4) scores a basket during an NCAA basketball game against the Yale Bulldogs. Frazier finished the game with 12 points and four assists. SMU Mustangs guard Keith Frazier (4) defends Yale Bulldogs guard Makai Mason (11). Frazier took over defensive duties on Mason who scored 16 points in the first half. 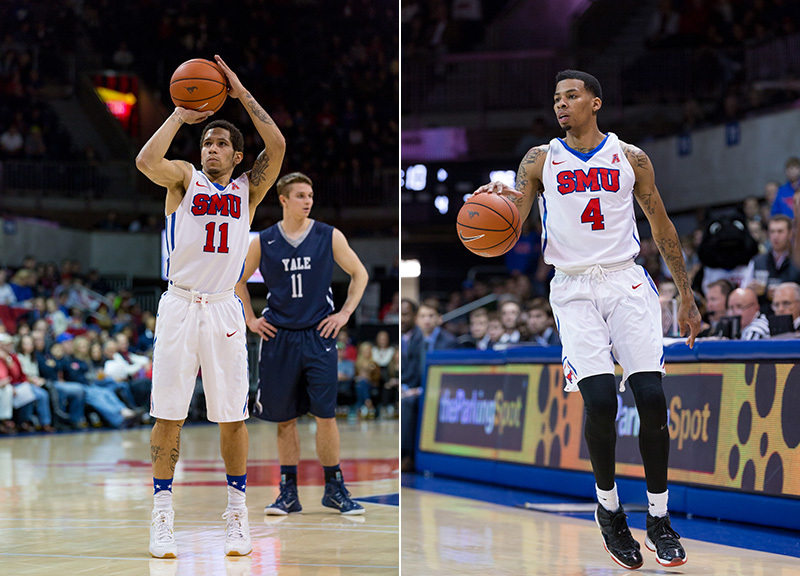 SMU Mustangs guard Keith Frazier (4) plays lockdown defense on Yale Bulldogs guard Makai Mason (11). Mason scored just eight points in the second half, compared to his 16 in the first half, after being defended by Frazier. 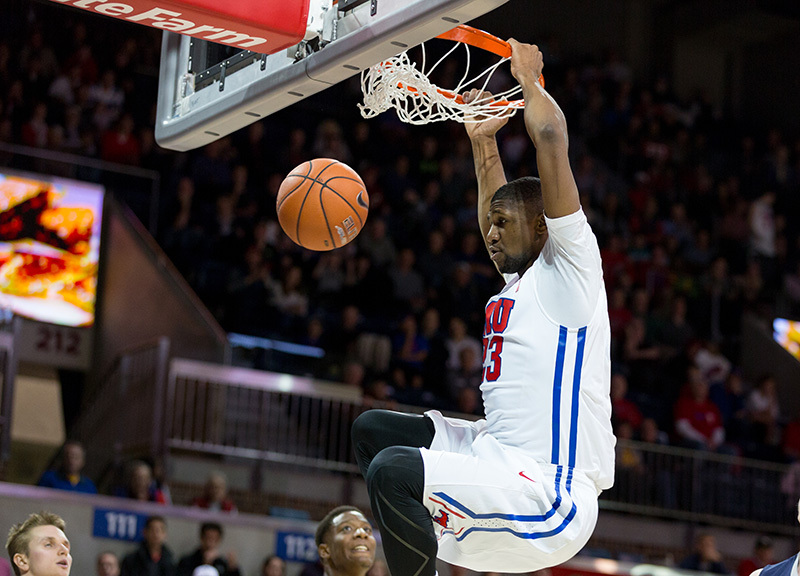 SMU Mustangs forward Jordan Tolbert (23) dunks during an NCAA basketball game against the Yale Bulldogs. Tolbert finished the game with 17 points and six rebounds. 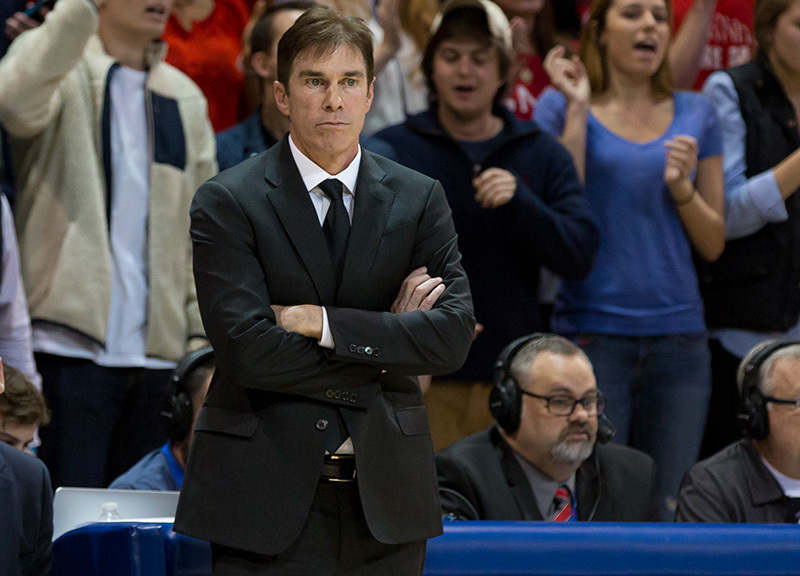 SMU Mustangs assistant coach Tim Jankovich looks on as his team takes on the Yale Bulldogs. 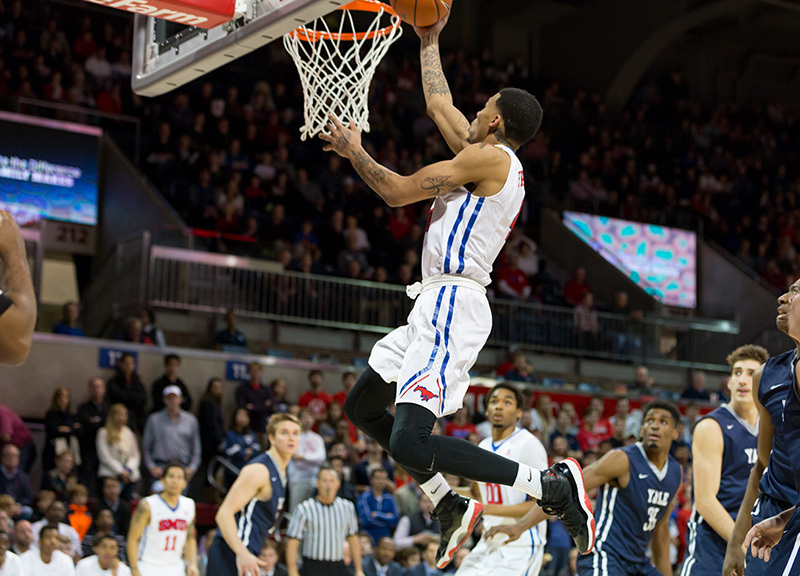 SMU Mustangs guard Keith Frazier (4) finishes an alley-oop from teammate Nic Moore. 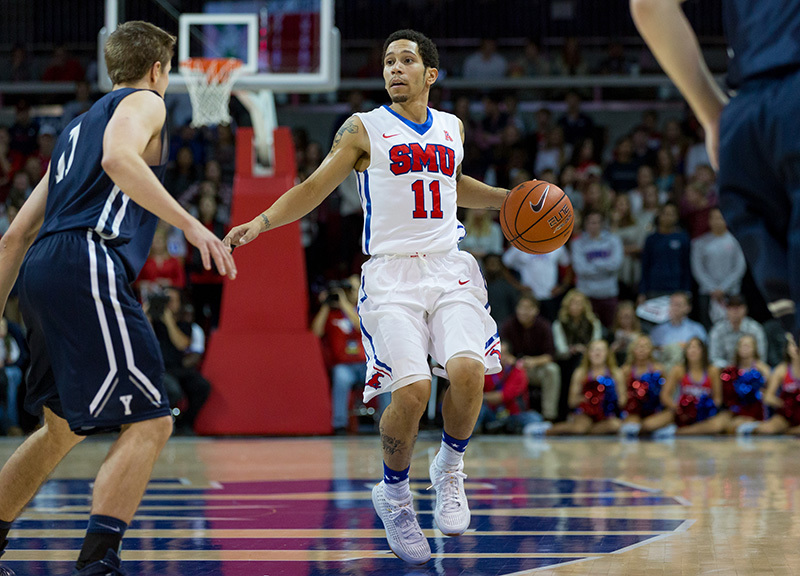 SMU Mustangs guard Nic Moore (11) sprints up the court during a fast break. game against the Yale Bulldogs. 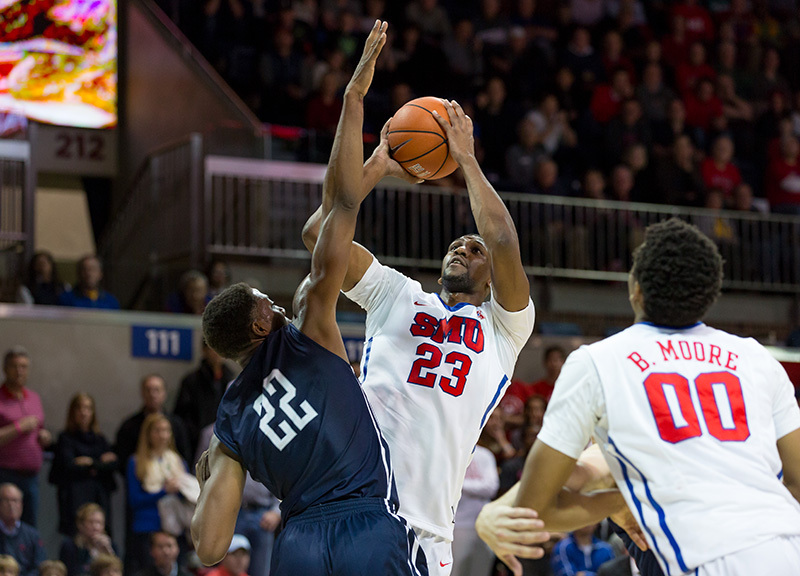 SMU Mustangs forward Jordan Tolbert (23) puts up a shot against Yale Bulldogs forward Justin Sears (22). Tolbert led the team with 17 points in the victory. 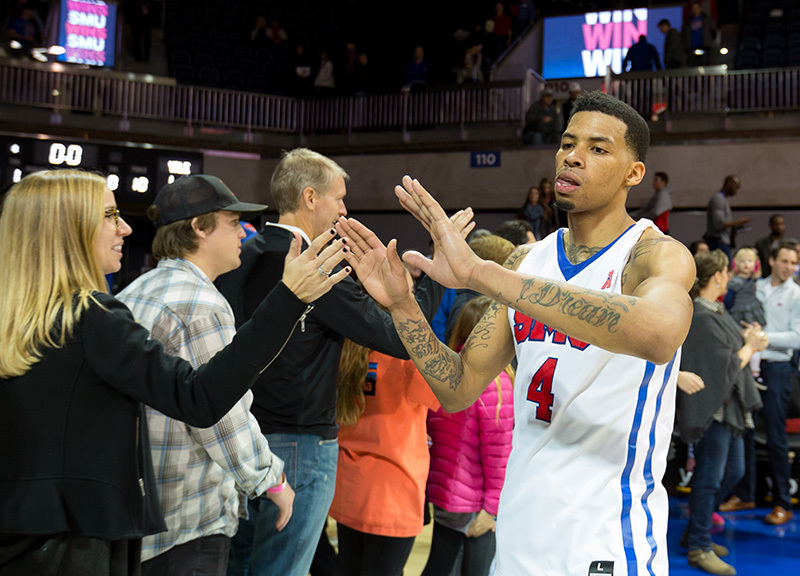 SMU Mustangs guard Keith Frazier (4) greets fans after his team's 71-69 victory over the Yale Bulldogs. Frazier and the Mustangs host the Brown Bears next Sunday, Nov. 29, at Moody Coliseum. Previous ArticleThings To Do On Tuesday, November 24.